If ever there was a culinary match made in heaven, it’s between seafood and the deep fryer. When it’s cooked within sight of salt water, preferably near where it was caught, and eaten while still mouth-burning hot – all the better. And if you’re wearing shorts with flip flops, and temperatures in the 80s are moderated by an ocean breeze, then you can fully appreciate the perfection of the paring. 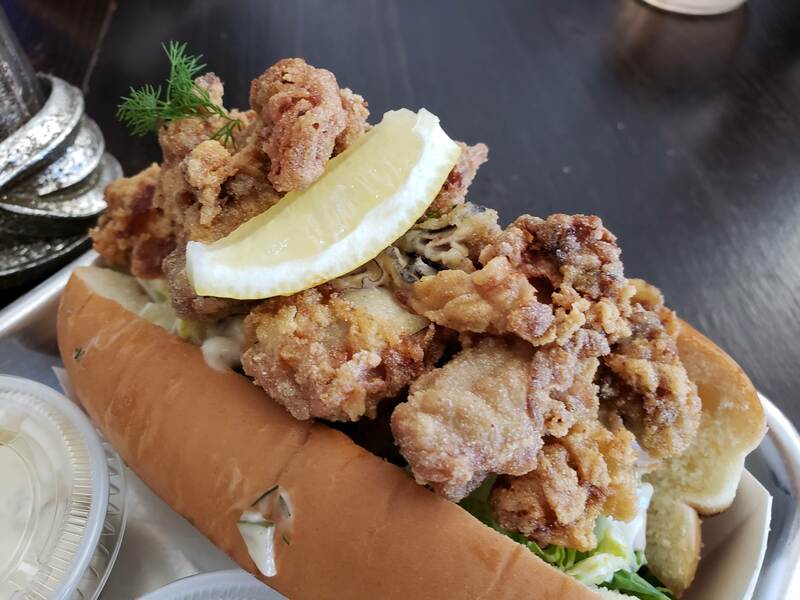 When I say seafood, I really mean shellfish – clams, scallops, and oysters – the trinity of the deep fryer. Fish fillets for much-loved fish and chips are high art when done well, but they’re usually batter fried, not breaded. Shrimp shines in the fryolator but comes from away, and fried calamari is a year-round staple. 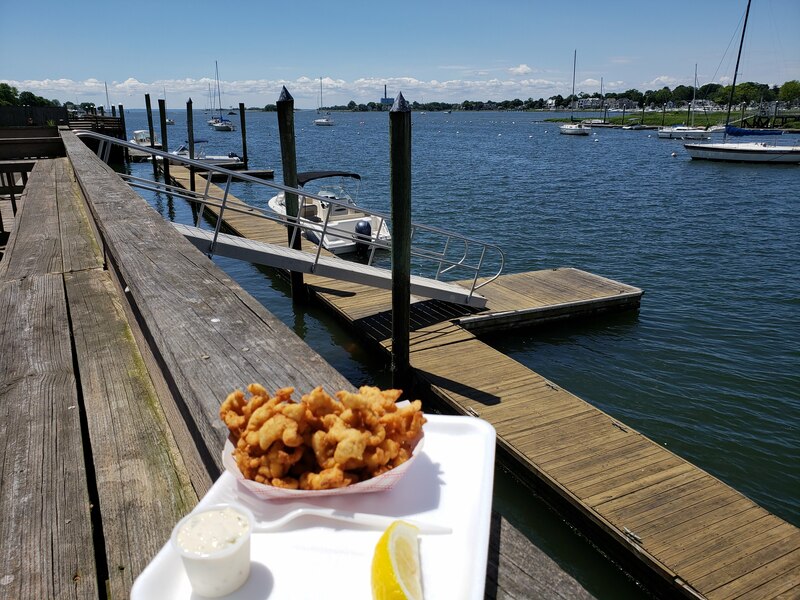 For now, I’m thinking about summertime clam-shack style eating. 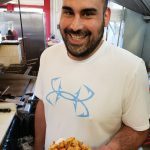 Jay LeBlanc, chef/owner at Knot Norm’s catering and eatery, insists that freshness is the most important factor for his fried seafood. He would of course, because he can walk down the block to the Norm Bloom oyster docks for a resupply of right-off-the-boat Copps Island bivalves. When I asked LeBlanc what he used for breading, he explained his preference for the term flouring, not breading. The oysters are dusted with a light coating of corn flour mixed with a dash of cornstarch for crunch. “Don’t overcook them,” he pleaded. 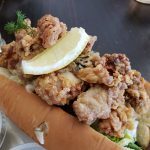 The oysters at Knot Norm’s are served in a cut sided, New England style roll toasted to a crisp golden brown on both sides. 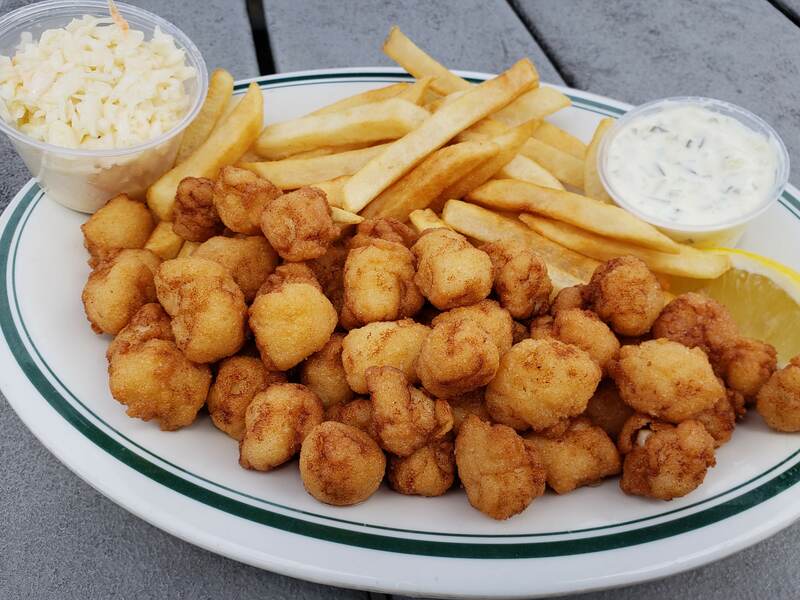 Oysters are the only fried shellfish on his menu every day, but you might see clams or scallops on as a special if they’re good enough to meet LeBlanc’s high standards. 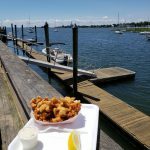 Overton’s, the classic clam shack at the edge of Norwalk harbor has been serving great fried seafood since 1948. “I’m here all day every day,” Nappy told me when I called. He’s the guy responsible for Overton’s reliable reputation. “Stop by anytime,” he encouraged. 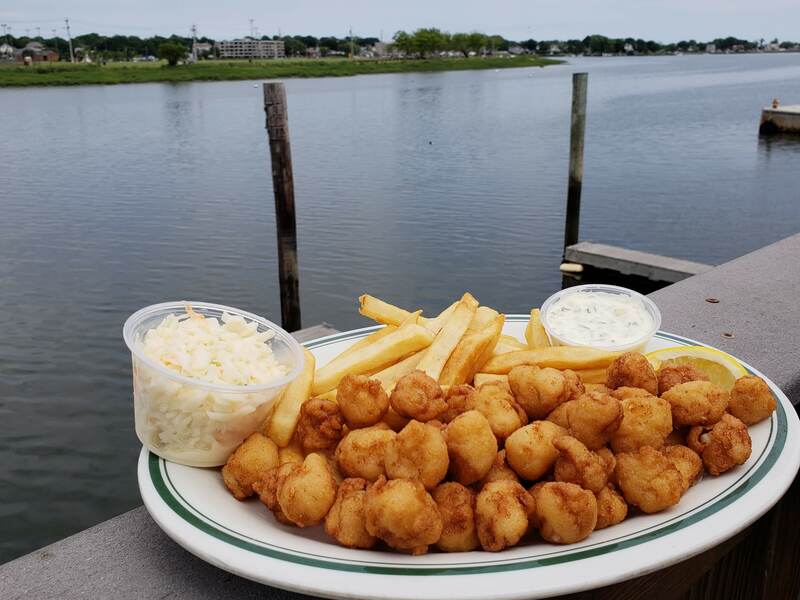 Shrimp, clam strips, clam bellies, and scallops are all hand-breaded with a practiced eye and sure touch. 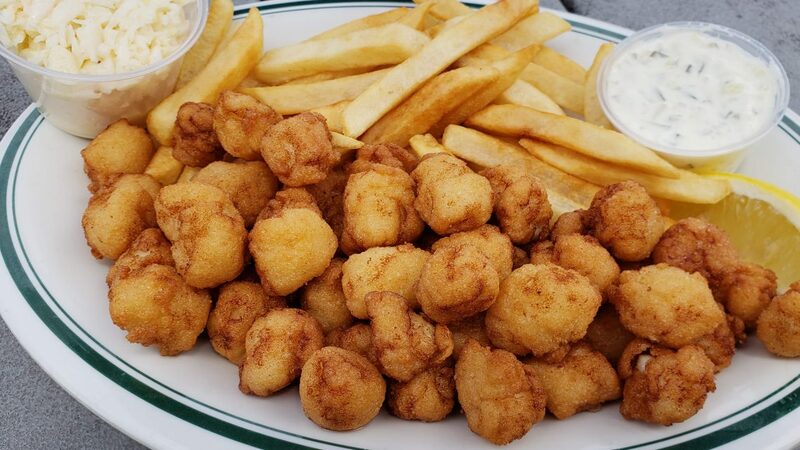 Shrimp are the most popular with clam strips a close second. 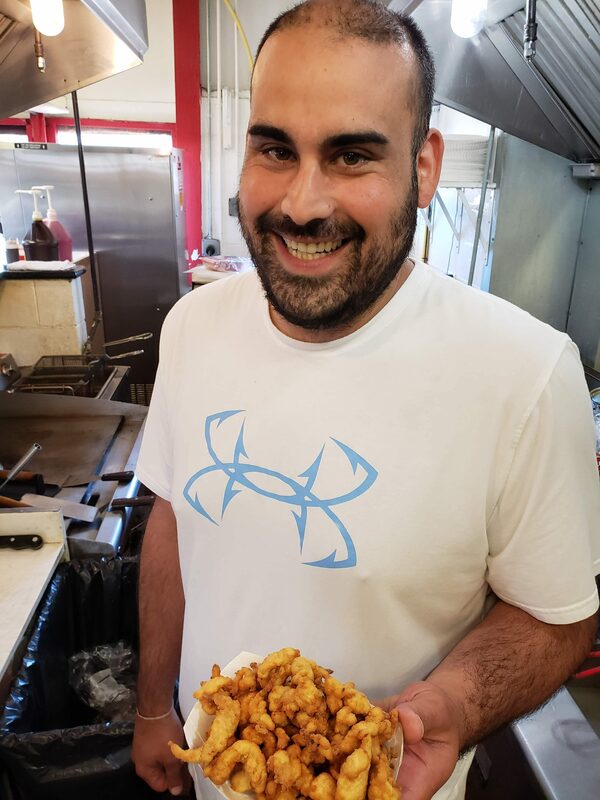 Beer batter is the secret ingredient at SoNo Seaport, owner Jack Cutrone told me. The beer makes for a light crisp coating. The scallops were a golden color, had a delicate crunch, and were perfectly cooked. 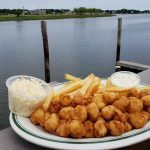 Cutrone gets his scallops and cod from New Bedford, clams from Maine, and Oysters from Copps Island, just across the harbor. Everyone agrees that clean, fresh oil is the key. At SoNo they use a no trans-fat vegetable oil and change it daily in the busy season. You can buy a deep fat fryer for home use, but I wouldn’t. 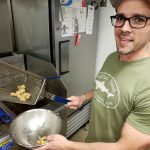 Fried seafood is complicated, messy, and benefits from commercial equipment. It’s one of those things that is better eaten out. Fry cooks judge doneness by color – shooting for the ubiquitous “golden brown” specified in recipes. Color is actually a measure of temperature. The hotter the food, the darker the color and the more cooked it is. Think about a slice of toast. You might like it light or dark, but too light, its underdone and too dark it’s burned. Same for fried seafood. 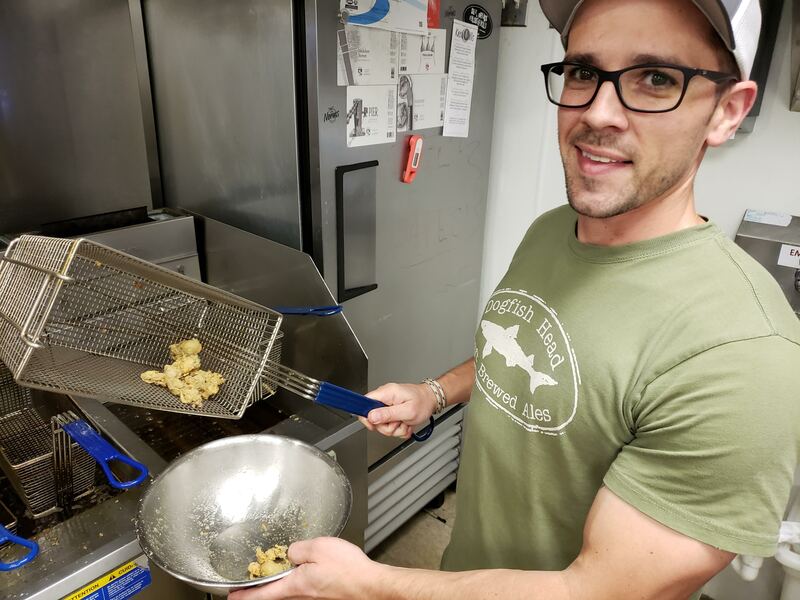 A large fryer is key to quality fried food. A substantial quantity of oil will keep its temperature when a small amount of food is added for a quick, light fry. Add too much food and the temperature drops leading to soggy breading. A small home fryer doesn’t have a chance. Tartar sauce is the go-to condiment for fried fish. At Knot Norms it was obviously home made with an unusual but welcome bit of heat. At Overton’s, it probably came from a jar, but had a just right sharp pickley tang. A platter of shellfish right out of the fryer – with a shake of salt and a squeeze of lemon along with a fresh sea breeze – it’s the perfect summer meal. Frank Whitman can be reached at NotBreadAloneFW@gmail.com. Previous Article From The Norwalk Hour: Take time to smell the roses. Then stay for lunch.